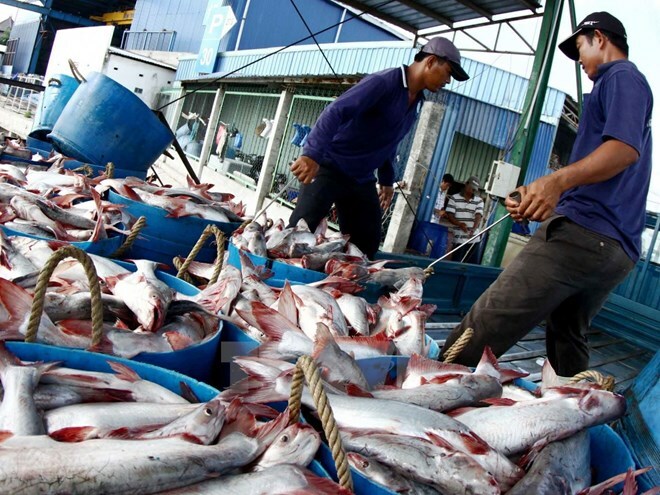 Can Tho (VNA) – Vietnam and Australia have agreed to set up long-term cooperation in combating illegal, unreported and unregulated fishing under a memorandum of understanding (MoU) signed in the Mekong Delta city of Can Tho on August 24 within the framework of the APEC Food Security Week. The signatories were Vietnamese Deputy Minister of Agriculture and Rural Development Ha Cong Tuan and Senator Anne Ruston, Assistant Minister for Agriculture and Water Resources of Australia. Tuan said the MoU, which was inked following their bilateral meeting, aims to deepen bilateral ties and create a foundation for the regular cooperation between the two governments in handling illegal, unreported and unregulated fishing activities. On this occasion, the two sides announced the completion of procedures to open door for Vietnamese dragon fruits to enter Australia and for Australian cherry to penetrate the Vietnamese market. The Vietnamese side suggested Australia build a shrimp laboratory in Vietnam to ensure the quality of Vietnamese shrimp exports.